Copper faucets, sinks and appliances have a lustrous color that helps create a warm atmosphere, making a house feel like a home. Copper and its alloys also are functional and durable. They resist corrosion and require little maintenance, which makes red metals an ideal choice for plumbing applications. In the past, plumbing parts were often made with leaded Brasses; adding Lead increased the machinability of the alloy. However, research has shown that exposure to Lead can cause adverse health effects, such as anemia, weakness, and kidney and brain damage. Lead exposure particularly affects children, who, because of their small size, tend to exhibit signs of lead poisoning at lower levels than adults. In 1996, to address the growing concerns about Lead toxicity, an amendment limiting the amount of Lead in drinking water was added to the Safe Drinking Water Act, which originally was passed by Congress in 1974. 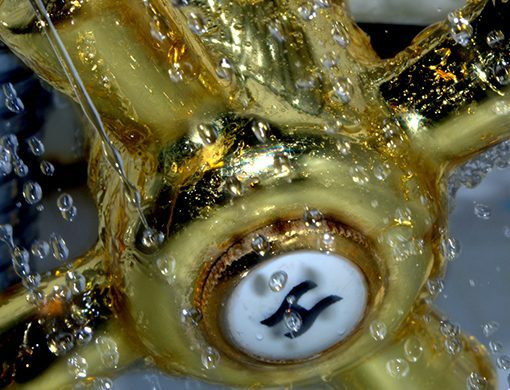 The amendment included standards for regulating leaded plumbing fixtures. Additional legislation, such as AB 1953, a California state bill that was signed in 2006 and amended the state’s Health and Safety Code to limit the lead content in plumbing products, and Vermont’s S152 spurred nationwide interest about the amounts of Lead in potable water. In 2011, Congress passed the Reduction of Lead in Drinking Water Act, which revised the definition of lead-free, lowering the maximum lead content of the wetted surface of plumbing products from 8 percent to a weighted average of 0.25 percent. To keep up with tightening regulations, manufacturers needed to come up with innovative new Copper and Brass alloys that could be used for plumbing. Many of these contain Bismuth as a replacement for Lead. Bismuth is Lead’s neighbor on the periodic table, and it’s a similar element; in fact, many early metallurgists confused the two. However, unlike Lead, Bismuth is non-toxic to humans. Other low-Lead alloys contain some amount of Selenium, which, when combined with Bismuth, helps increase the machinability of an alloy. Zinc and Tin also are commonly used in Copper and Brass alloys, providing strength and hardness. Silicon Brasses and Bronzes are another popular low-Lead alternative. These alloys typically contain high amounts of copper (approximately 96 percent); silicon (approximately 3 percent); and trace amounts of other elements, such as manganese, tin, and zinc. They are easily pourable and have an appealing finish and high corrosion resistance. Brooklyn, New York-based Belmont Metals carries a wide range of brass alloys that meet Copper Development Association specifications and can be used in plumbing applications. Belmont’s Everdur Silicon Bronze has a pleasant color, can accept a range of patinas, has good fluidity, low drossing, and a reasonable solidification range. It is widely used in both creative and industrial applications, including sculpture, jewelry, valve and pump parts, impellers, and bells. The company’s Special H Silicon Bronze 4939 has good corrosion resistance (comparable to pure copper) and high strength (comparable to low- and medium-carbon steels). It’s used for bearings, valve parts, rocker arms, pump parts, bells, and small propellers and gears. To choose the low-Lead or Lead-free alloy that’s right for your application, consult with a trusted alloy manufacturer or supplier.